Yes that is a cake! I could hardly believe it at first! 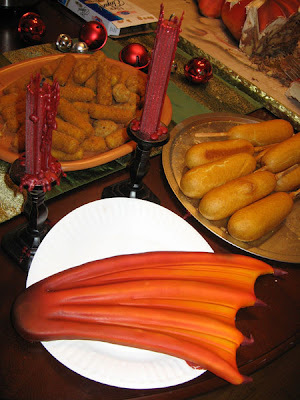 I found this while searching Google images for some writing inspiration. It's AMAZING! 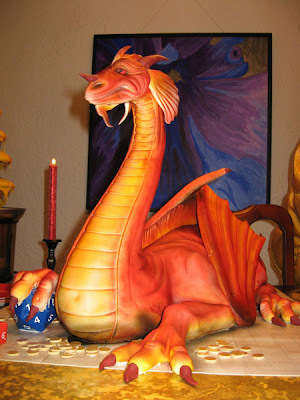 This cake was created for a special D&D get together, followed by a meal of corn dogs and cheese sticks! What a feast! I just couldnt imagine being the one to cut into this precious cake. I couldnt do it. I would want to flash freeze it and put it on display somewhere. Just look at the poor thing below. It would be heart breaking...I wonder if it had a heart! You can view the entire Photo Stream on Flicker. Truly fantastic! wow, now that IS a cake. I'd hate to see the pans they had to use. 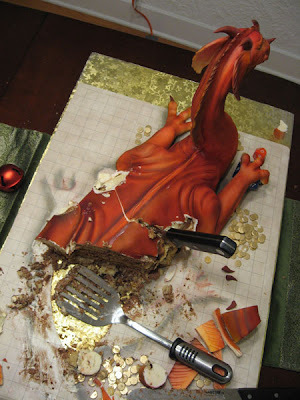 wow,now that is a cake that i would want every year.